I think this is my very first fish cutting board thrift shop find. I usually clean my cutting boards with Krud Kutter to remove any residue from cooking oil. Krud Kutter is also great for cleaning crud around the house. I paired the cutting board with a very large wooden candle holder from my stash. I used a 1/4" x 2" dowel screw to attach the cutting board to candle holder to create yet another cutting board shelf/riser for decorating. Drill a starter holes in each piece so the two pieces don't twist together crooked. To give my fish riser a beach-y feel, I brushed on some Varathane wood stain in sun-bleached gray. Since the base had already been stained and may have had a sealer, I rubbed off almost all of the stain so it wouldn't be sticky. Stain that doesn't soak into the wood will sit on top and become sticky. Once dry, I sealed the piece with Varathane Crystal Clear Matte water based poly. The knife marks became much less visible after sealing. Here is my little fish cutting board makeover! 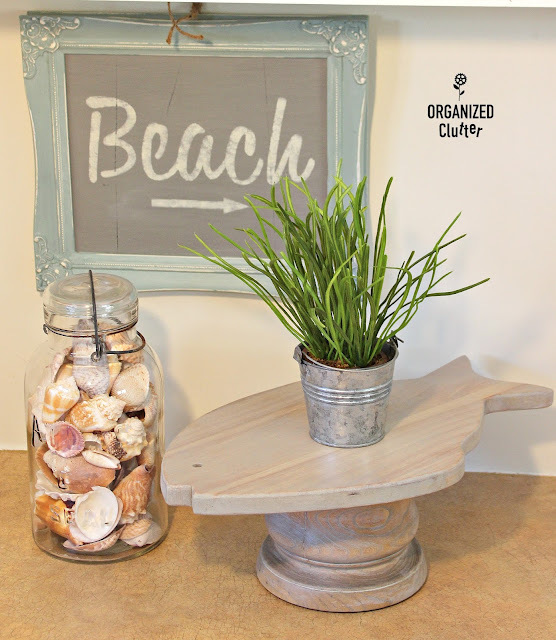 I also added a piece of upside down bead board paneling to a decorative picture frame and stenciled "Beach" in ivory paint on a gray background. 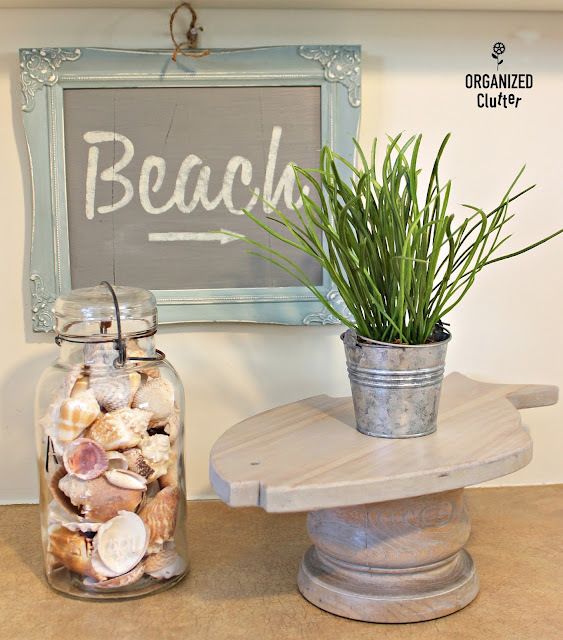 The Beach stencil is from the Old Sign Stencils Getaway Collection. One of a kind decor! SUPER fun, Carlene! You certainly take cutting boards to an all new level! So beachy! How cute! I have a fish cutting board that my son made in shop in high school that I used daily. I haven't seen very many fish ones. So darn cute, Darlene! Beyond unique! Really nice repurpose. So perfect with your "Beachy" display. Amazing! It really make me think about a beachy day! This would be so great to put a bowl of shrimp, or fish dip or cutt lemons. Love this! Great Job!